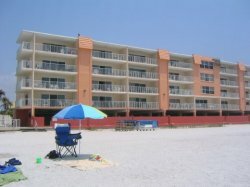 Magnificent 2-bedroom/2-bathroom condominium beach vacation rental in family resort oceanfront property on Indian Shores beach on the Gulf of Mexico. Indian Shores is a unique, relaxed gulf coast community located 20 miles west of Tampa in the middle of an island with Clearwater to the north and St. Petersburg Beach to the south. Busch Gardens in Tampa Bay is 45 minutes and Orlando Theme Parks (Disney World, Sea World, Universal Studios, MGM, Epcott Center) are 90 minutes. Surrounded by warm, gentle surf and plenty to do. or do nothing but savor the relaxed atmosphere and walk barefoot on the beautiful soft, white sandy beach right outside your door. Our Olympic-sized pool, heated in winter, cooled in summer offers sun, shade, and great place for a poolside barbecue or picnic. Our spacious, luxury Florida gulf condo is completely equipped with all amenities. It has been updated and redecorated, including beautiful new ceramic tile throughout the entire condo. 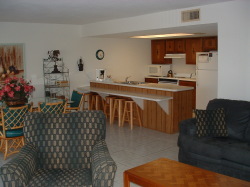 For your entertainment when you're off the beach, there is Cable TV in all rooms, a VCR and stereo in the living room,. Our Florida gulf coast family condo has a beautiful, modern, full-size kitchen that includes a large refrigerator with ice maker, stove, oven, microwave, dishwasher, garbage disposal, coffeemaker, cookware, bakeware, glasses and utensils. Our breakfast counter located between the kitchen and dining area provides additional seating for five so up to 11 people can dine in comfort. The master bedroom has a queen-size bed and private full bath. The second bedroom has two full-size beds and separate full bath. Our Florida gulf coast condo in Indian Shores boasts a private balcony with patio furniture and has a beautiful view over the intracoastal waterway and Tiki Gardens across the street. Assigned, reserved parking space in our under-the-building parking garage protects your vehicle from heating up in the hot Florida sun. The onsite building management with full time maintenance staff highly maintains both the building and individual vacation condos. Easy access to all central Florida and gulf coast world-famous attractions, including Disney, Orlando theme parks, Universal Studios, MGM, Wet and Wild Water Park, Epcot Center. Our luxury gulf coast Florida vacation condo is only 45 minutes from Busch Gardens in Tampa Bay. Walk to minimarket, great restaurants, shops and entertainment. Enjoy beachside volleyball, swimming in the warm Florida gulf coast waters and heated pool, sunning, snorkeling, shelling, sand castles, fishing, boogie boarding, parasailing, miniature golf, public golf courses and glorious sunsets. Watch the dolphins traveling the beautiful gulf coastline. The gulf coast offers stunning sunsets over the ocean and picturesque sunrises over the intracoastal waterway. Dinner cruises, deep sea fishing, dolphin watching cruises, casino cruises, every imaginable water sport, including jet skiing, parasailing, boogie boarding, snorkeling, scuba diving and body surfing are available during your gulf coast vacation. Take a cruise across the gulf coast of Indian Shores to Shell Island and you can walk around on this deserted island surrounded by the beautiful gulf waters, collecting sea shells and other ocean treasures as souvenirs of your memorable Florida dream vacation. We guarantee you and your family a fabulous time and memories of your Florida gulf coast vacation that you will talk about for years to come.